The Harker property consists of 11 contiguous mining claims covering 153 hectares located in the northwest part of Harker Township in the Larder Lake Mining Division, eight kilometres west of the Holloway and Holt-McDermott mines. The main branch fault of the DPFZ is located 900 metres north of the Harker property, striking east-west, and is marked by a sequence of DPC metasediments. A subsidiary branch, striking north-east extending from the northwest corner of the property, is also marked by a sequence of DPC metasediments. This subsidiary branch was drilled extensively in the 1940s and 1980s. Another branch of the DPFZ crosses through Harker Township, 2.1 kilometres south of the property, just north of Imperial Lake. This branch strikes east-northeast and is marked by a sequence of DPC metasediments on strike with the Consular Ben-Arch-McDermott Fault. The west part of the property is underlain by a sequence of mafic and ultramafic volcanics while the east portion is underlain by a felsic to alkalic syenite intrusive, locally called the Dale Intrusive. On the Harker property, the Dale Intrusive is part of a pluton that is at least 2.1 kilometres long and 0.7 metres to over 1.0 kilometre wide, trending north-northwest-south-southeast and appears to have been intruded along a fault oriented in the same direction. The Dale Intrusive has assimilated mafic volcanic rocks to produce hybrid phases. Dykes off of the Dale Intrusive also penetrate into the volcanics. 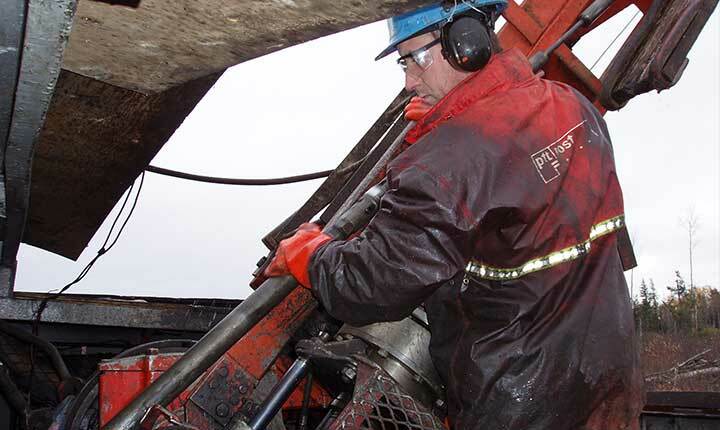 No clear or persistent structures in the intrusive have been identified in drill holes; however, magnetic data suggests the presence of structures going through the intrusive. The northwest section of the Harker property is underlain largely by ultramafic rocks often logged in the reverse circulation drill holes as talc-chlorite-carbonate schist that is intercalated with basalt. Numerous gold occurrences are known in Harker Township, most of which occur in fault or shear zones in association with chert-like rocks that may have several origins or may all be closely related in terms of genesis. This type of mineralization occurs at the Holt-McDermott mine, nine kilometres east of the Harker property, and the Golden Harker deposit in the southeast corner of Harker Township. The felsic horizons are variably described as interflow chemical sediments, rhyolites or silicified intermediate to mafic rocks. The horizons are sheared and the silica characteristics of these zones is either syngenetic and has controlled the location of mineralization and deformation as a consequence of competency contrast with enclosing basalts or is the result of silicification accompanying mineralization. The Dale Intrusive may also be an important control for mineralization in these structures as many of the mineralized structures are located close to it or to related smaller intrusives. Almost all of the diamond drill holes completed on the Harker property (17 holes totalling 2,316.5 metres) were drilled to test for mineralized structures in the intrusive striking parallel to the north-south trending contact between the intrusive and the volcanic regimes. All gold values discovered to date have been associated with syenite within the Dale Intrusion that dominates the eastern side of the property. Of the 17 diamond drill holes that have been drilled, 12 were almost entirely in the syenite. Mineralized sections of the syenite are darker red and often contain specular hematite and streaks of magnetite. Various phases commonly contain quartz veinlets and 1% to 5% euhedral pyrite. Thirty diamond drill core samples taken from the holes returned assays exceeding 1.0 grams of gold per tonne. The highest gold value found on the Harker property was returned from drill hole NH-85-1 where a one centimetre wide fracture in syenite containing visible gold assayed 14.6 grams of gold per tonne over 0.43 metres. Visible gold was also recognized in NH-86-3 at 47.8 metres with disseminated pyrite in a quartz veinlet. The best zone of mineralization was cut in hole NH-86-6 where a value of 2.55 grams of gold per tonne over 3.90 metres was returned. An adjacent hole, NH-86-7, returned a value of 1.37 grams of gold per tonne over 6.22 metres. These two intersections may occur in a structure that runs sub parallel to the drill holes and previous diamond drilling was poorly oriented to test such a structure. Most of the gold bearing shear/fault zones in the area cutting volcanic rocks or intrusives strike from about 40 degrees to 90 degrees, suggesting that such a structure may host the intersections in holes NH-86-6 and NH-86-7. 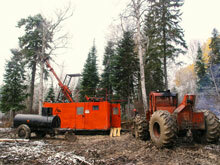 In 1997, Plato carried out magnetic, VLF-EM and IP surveys over the entire Harker property. This work outlined anomalies that may represent DPFZ subsidiary faults and/or the favourable contact between the ultramafic and basaltic regimes. Plato believes there is good potential to locate gold mineralization associated with DPFZ subsidiary structures on the Harker property. Regional analysis suggests such zones strike east-west, northeast or east-northeast and it is likely that more than one such structure crosses the Harker property. Osisko Mining Inc. holds 80% interest in the Harker property with Plato holding the remaining 20%.